A lovely spring to early-summer flowering plant with glossy green leaves and lots of single white flowers with yellow centres. There are attractive cottony seedheads in winter. This plant looks good in the front of borders, pots or in a rockery, growing to a height of 20 - 40 cm. Can also be used for part-shady ground cover. 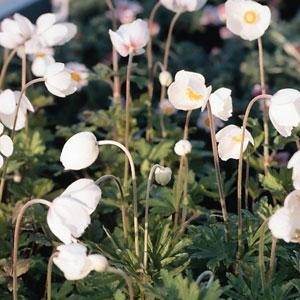 Anemone sylvestris grows best in sun to part shade and well-drained, moist and composted soil. Pack of 30 seeds. Sow in spring to autumn. Sowing instructions and a colour photo are printed on the packet. Conditions Moist but well-drained humus-rich soil in sun to part shade, although drier conditions are tolerated when dormant in summer. Sow spring to autumn. Sow in moist seed compost with a light covering of seed compost or vermiculite and keep at 10-18°C. Germination takes 2-4 weeks. Pre-cool the tray of sown seeds in a fridge for 2 weeks to improve germination. Protect summer/autumn sowings over the first winter in a greenhouse or cold frame, and plant out in the spring. These are low maintenance plants once established. Trim them back after flowering if they look untidy. Watch out for powdery mildew. Plants spread naturally, and can be divided in early spring.